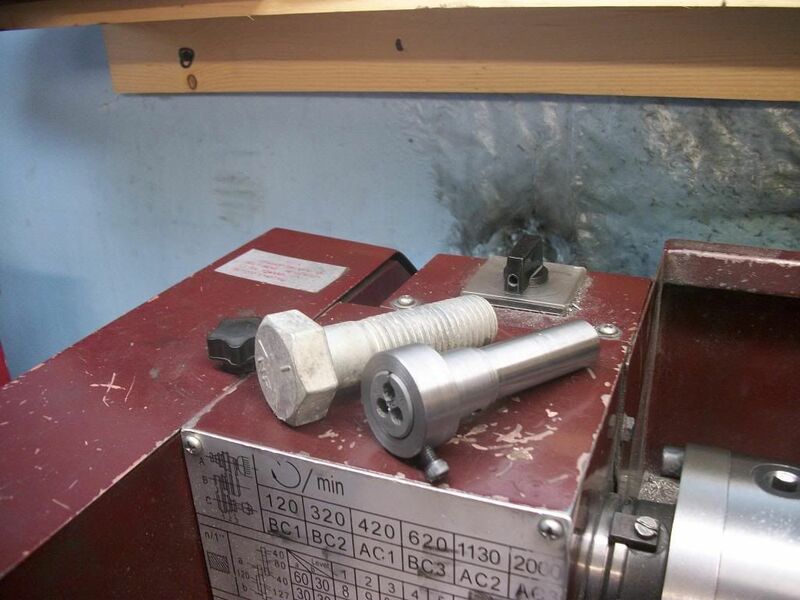 That is a Grade 5 bolt and its brother after some modification. The bolt is from the scrap yard and I bought enough to hold all of my dies and some extra for those to come. They sell by the pound and a little calculating puts them at about 60 cents each. Not seen is a hole for the handle and a 1/4" hole in the back end to ride on a shaft in the tailstock chuck. I should have done this years ago. Nice idea. I have some odd size dies and no way to hold them yet. I like the idea of fabbing something and this looks very useful. That bolt turned down nice Jerry. Is there a bore behind the die for longer threads? Very neat idea!! Yes there is. First step was to chuck it up by the head and drill a hole for the live center. Then I turned the threads off and brought the shank diameter down to .725" so it would fit in the spindle bore. Sharp brazed carbide bit, high speed (1100 rpm), and .010 DOC brings up a nice finish. Then I reversed it and chucked it by the shank so that I could take the corners of the hex. Speed reduced to 600 rpm but the DOC was increased to take the corners of in ONE PASS, still using brazed carbide. This is a Grade 5 bolt (pretty hard). If you try to do this by taking shallow cuts, the pounding of the intermittent cut will fracture the carbide bit and it will beat the crap out of a HSS bit and shake the filings out of your teeth. I set the depth by bringing the tip of the bit up against the center of one of the hex faces. If you have never done it this way, you will be amazed at how quiet and smooth the cut is. No pounding at all. I hand feed the carriage. Then I faced the end and made a 5/8" diameter hole about 1 inch deep, drilling in steps of 1/4", 1/2", and 5/8". My round dies are 13/16" so I used a carbide boring bar from my boring head kit and brought the ID out to 13/16" + to fit but just to a depth slightly less than the dies. There is plenty of space behind the die for thread length. The most difficult part of the job was drilling and tapping the radial hole for the #6-32 locking screw. That material is tough and I fear for my tap, using lots of lubricant and frequent reversing to clear the chips. Two more steps. Drill a cross hole 3/16" for a turning bar and back into the lathe to drill a 1/4" hole in the tail end for a guide bar. It took about the same amount of time to make it as to write about it. Tomorrow, I will make 5 more. Nice adaptation. I have some smaller dies that have no holders and need something. This should do. When I get in a pinch I put the die in the lathe chuck and hold the rod in my drill chuck from the tail stock and just turn that. Works if you don't have the proper tool. I love little bits of tooling like this, cheap and cheerful I call them. Cheap to make, but do a great job, and within the scope of everyone. I made one for my smaller dies last night. Just left the hex head of the bolt rather than turning it round. Figured it just gave me a little extra grip when holding it. Thanks for the tip! Bad Behavior has blocked 16435 access attempts in the last 7 days.